In the hours leading up to the New England Revolution's 2-1 win over The New York Red Bulls this past Saturday, I stuffed my belly full of chili and cornbread in the parking lot of Gillette Stadium. Why? For the second annual Midnight Riders chili cook-off, of course! The afternoon was delightfully fun, thanks partly to the spirited camaraderie of my fellow Midnight Riders and partly to the much longed for spring afternoon weather. We cooked, we ate, we raised funds and food for the Greater Boston Food Bank. You probably know I'm not one to shy from a little friendly competition. I entered the cook-off with a title to defend! 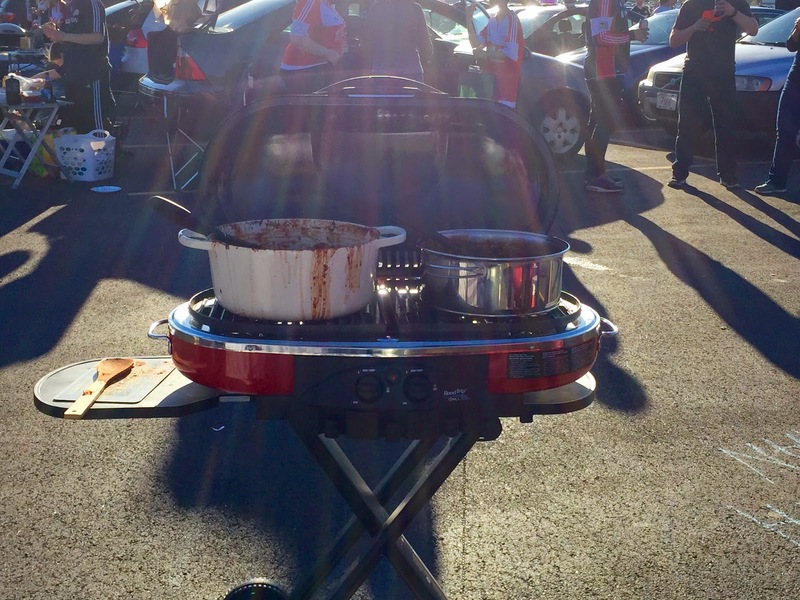 This year's contest featured fifteen chilies cooked by my fellow tailgating enthusiasts. Every single chili looked and smelled fantastic. I can't tell you how most of them tasted, though, because vegetarianism limited me to sampling a total of three (one being my own). Yes, this also means I was one of only three people competing in the vegetarian category. Minor detail! Competitors! Or: "Two veggie chilies, one grill"
I took home a medal and a repeat victory in the vegetarian category for a Sweet Potato and Two Bean Chili with Hominy. The biggest shortcoming of most vegetarian chili recipes is a noticeable flatness in flavor and texture. When you pour a few cans of beans and tomatoes, maybe some chopped veggies, and some chili powder into a pot, the result may taste decent. 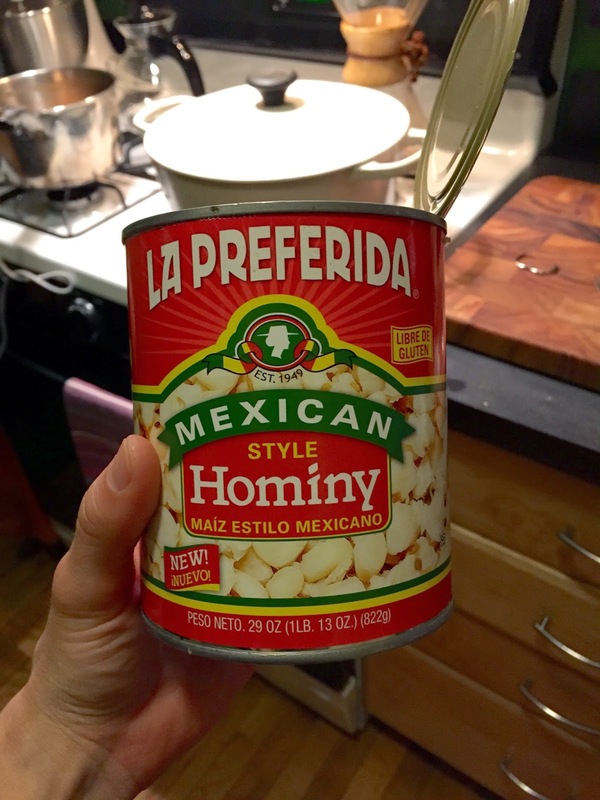 Rarely does it taste interesting or complex. Since I was unwilling to use faux meat to beef up my chili (pun definitely intended), I would to find texture and depth elsewhere. I combed through every cookbook I own and every food blog I know in search of a winning vegetarian chili recipe. The moment I stumbled across the recipe for Sweet Potato and Two Bean Chili with Hominy on Serious Eats, I knew I had my solution. 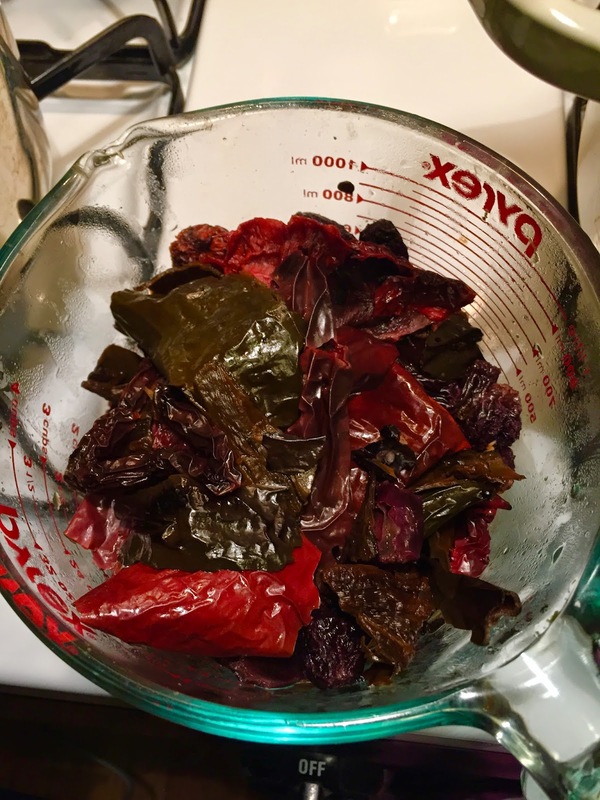 Chili Paste. The recipe included instructions for making my own chili paste using a mix of good quality dried chilies--some smoky, some hot, some sweet, some fruity--that were rehydrated in a mix of orange juice and raisins and then blended into a paste. This extra step, though a little time consuming, helped achieve the complexity I sought. Pluse, you can never go wrong with sweet potato in the mix. I am well aware there are camps of chili purists who staunchly argue that I CANNOT call it chili if it A) doesn't include meat and/or B) it contains beans. Welp, it may not be traditional, but my vegetarian version was cooked slowly in a pot and seasoned with chili peppers and spices, so I'm calling it chili. Since I followed the recipe exactly as written (though I elected to omit the optional vegemite), I won't reproduce it here. Follow the link above to see the recipe in its entirety. I can promise you won't be disappointed if you make this. After all, it's prize-winning chili! 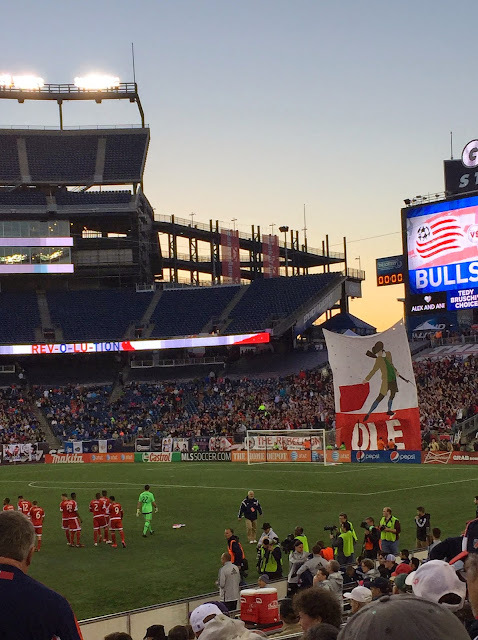 The rest of the evening was no disappointment either, thanks to a Revs victory.